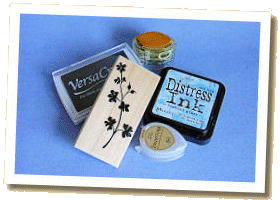 Once perhaps not considered worthy of attention by serious artists, rubber stamping is now widely accepted as a legitimate altered art technique. Whilst you will still find those often crude cartoon characters, an increasing number of manufacturers and specialist suppliers are now offering a huge variety of rubber stamps featuring images that range from the cute to the extremely sophisticated, so that there really is something for every taste. Of course, we'll be especially interested in the multitude of designs now available that are particularly suitable for the altered and mixed-media artist. These include many of those themes that are so common in this artistic genre: time, travel, vintage images, and the natural world. Indeed, there are a number of specialist manufacturers who cater for this market by producing designs of this nature. Rubber stamping is probably one of the most popular crafts, and certainly the easiest way to create an image if you're not good at drawing, or a series of identical images. Thanks to today's wide range of rubber stamping inks, too, you're not limited to paper and similar materials; you can stamp on glass, plastics, ceramics, fabrics and many more. What we have loosely described as 'rubber' stamps may actually be made of either latex or clear polymer, and can be obtained both mounted and unmounted. In the next few pages we'll be talking about the advantages and disadvantages of each of these types, and what to look for when buying your stamps. We'll also be taking a look at all the different kinds of stamping inks, and giving you our advice on which of them is the best to use for each purpose. We'll also be sharing with you our tips for getting the best use out of your tools and materials, and later introducing techniques that will help you to increase the range of effects that you are able to produce. Amongst other things, we'll be looking at what you can achieve by using a rubber roller (a technique often referred to as brayering), various forms of embossing, direct-to-paper techniques, and faux batik or resist techniques.